as too hot and it will kill the yeast. Preheat the oven to 200C, 400F, Gas Mark 6. Place the flour, spice, spread and fruit into a large bowl. Rub the mixture together between your fingers until the ingredients are fully combined, making a well in the centre. Dissolve the yeast in 150ml of the water adding the sugar and pour into the centre of the flour. Gradually add the remaining water mixing the ingredients to a soft dough. You may not need all the water, but if the dough is too wet add a little more flour. Knead the dough for 5 minutes then cover with a damp cloth and allow to rise for 30 minutes. Knead the dough again and divide into 4 pieces using a knife. Divide each quarter into 4 and roll into small balls. Place on a baking tray and leave to prove for 20 minutes until double in size. Mix together the cross mixture to a smooth batter and place in a piping bag. 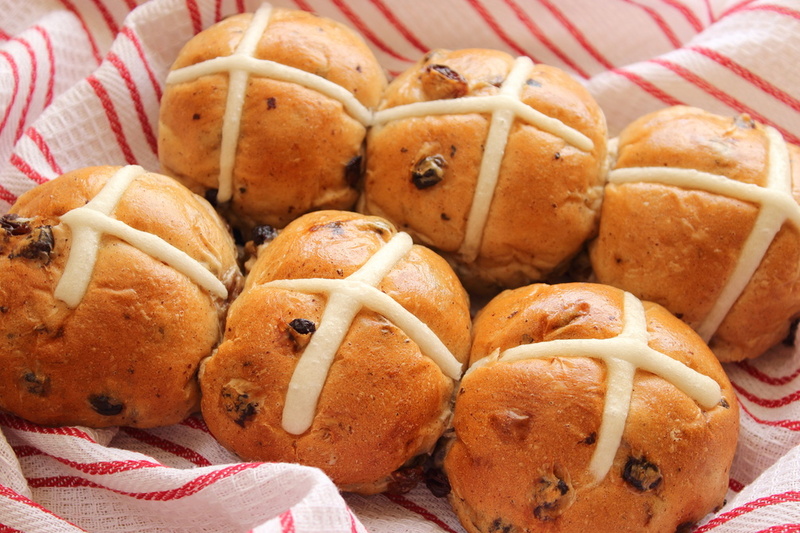 Pipe a cross on the top of each bun and bake in a preheated oven for 20 minutes until golden brown. When cooked mix together the glaze ingredients and brush over. Serve warm.